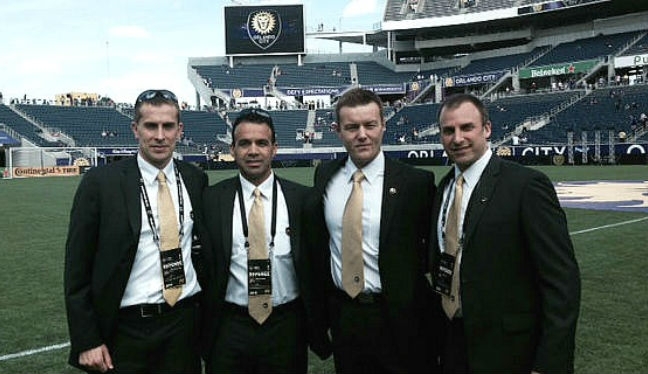 Referee Alan Kelly feels honored and privileged to have been a part of the landmark MLS game between Orlando City and New York City at a sold-out Citrus Bowl on Sunday. In a fast-paced 90 minutes, the two new MLS franchises battled out a 1-1 draw, with Kaka scoring a late deflected free kick to give Orlando a share of the spoils after Mix Diskerud had put New York in front. Following the game, Kelly told proreferees.com: “When you are part of the game as an official, you endeavor to focus on the job at hand and try and block everything else out. “It was tough to do that for this game. Even on the way to the stadium, we could see huge numbers of fans, lots of color and a real positive atmosphere. It was a fantastic advertisement for MLS with such a big crowd in attendance and a big TV audience here in the US as well as overseas. “Tremendous credit goes to a lot of people who were involved in putting the whole event together. It only enhanced MLS’s ever growing reputation. “But there wasn’t any nerves from the officiating crew. The banter in the locker room pre-game was good and that made for a positive, relaxed, tension-free vibe. I really do enjoy the game build up and once the focus is set on the game, the adrenalin kicks in and the concentration levels increase. Kelly was assisted by Adam Wienckowski and Brian Dunn, with the experienced Hilario Grajeda on fourth official duties, and the man in the middle blew for 31 fouls, brandishing six yellow cards and one red. 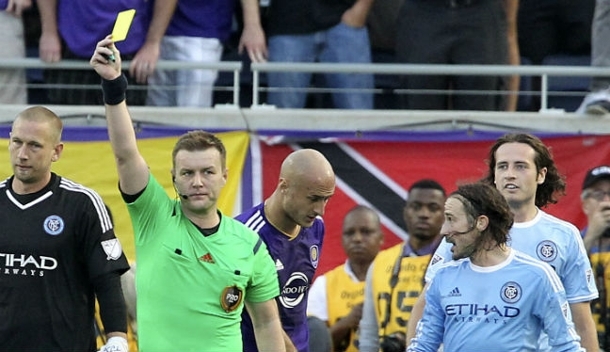 The officials also had to marshal Josh Saunders’ head injury, after the NYCFC goalkeeper had a nasty collision with the post in the first half. “It was a challenging game to referee with some tough calls to make but I am happy that we as a crew called the big decisions correctly,” Kelly added. “The incident with the goalkeeper was unfortunate and clearly not intentional. However, our focus was on the player and ensuring that he got immediate medical assistance which, thankfully, he did. When a player has a head injury it is important to check in with him from time to time which was the case. “In terms of aims and targets this season, I have set some for myself. That being said, in the game that we are in, and I know it’s a cliché, but it really is just to focus on one game at a time and trying to establish myself as a referee in MLS.